What do the Java versions mean on the System Info tab? The System Info tab on each realm contains a Plugin Info section that has multiple Java versions listed. What is this for and does it mean that Java is required on the IdP? The listed Java versions relate to a seldom used feature, namely Java certificates. 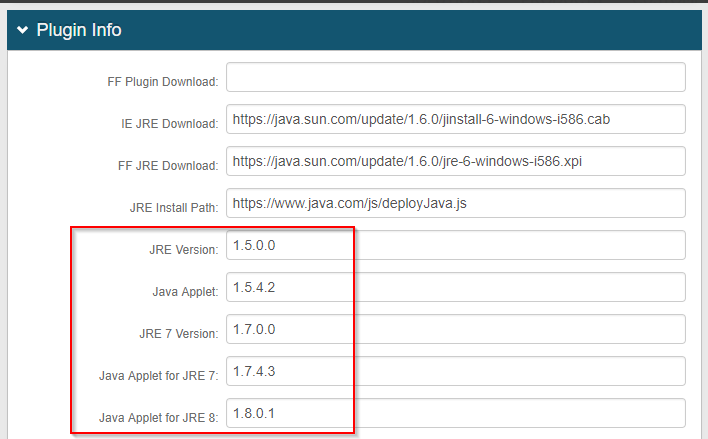 If the client has Java 7 installed then it will use applet version 1.7.4.3, or if an older Java version is installed then applet version 1.5.4.2 will be used. The version numbers are therefore only related to which versions of Java is tested for, and does not indicate what version is installed on the IdP or mean that it's required to be installed on the IdP. If not using Java certificates these settings can be dismissed. What do JRE Versions mean in the System Information tab?